Prototyping. In plastic spot welding or staking, the optimum contour of the horn face may not be known. Then prototype tips with different contours can be tried without the need to machine an entire custom horn. Wear. A horn's face will wear or deform due to abrasion, cavitation, or impact. This wear causes frequency, amplitude, and application problems (see below). A solid one-piece horn would be expensive to replace after such wear. Instead, expendable tips may be used (see figures 1). However, if reliability is a high priority (e.g., for high volume applications, especially where downtime should be avoided) then a custom solid horn may prove more satisfactory. 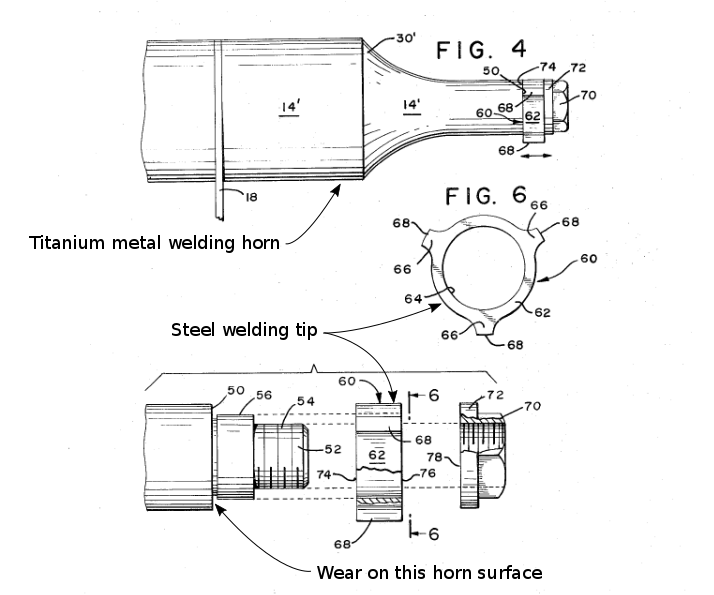 Then the horn's output surface could be coated with chrome, carbide, or titanium nitride for improved wear resistance (although these may not be successful against cavitation erosion). If cavication erosion is a problem then see here. Tips have limits on weight and amplitude in order to limit the inertial forces on the threads and tip-horn joint. The maximum tip diameter is typically limited to about Ø25 mm at 20 kHz. The smallest tips allow the highest amplitudes. The mass and maximum amplitude are for flat-faced tips. However, other tips (e.g., staking, spot welding) should also probably conform. The mass includes the threaded shank. The maximum amplitude may be determined by the input amplitude to the horn and the horn's gain rather than by performance requirements (tip heating, tip or horn fatigue, joint galling, etc.). There seems to be a consensus that a replaceable tip should not be used if it will be submerged in organic solvents or low surface tension liquids. For example, Sonics & Materials (p. 2) says, "Organic solvents (e.g., methylene chloride) or low surface tension liquids will penetrate the interface between the probe and the replaceable tip, thus carrying the particulates into the threaded section and isolating the tip from the probe. When processing samples containing organic solvents or low surface tension liquids, ALWAYS use a solid probe. NEVER use a probe with a replaceable tip." 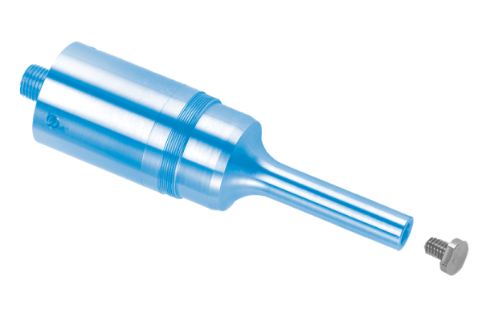 Instead, the tip can be replaced by a half-wave or full-wave extension horn or a solid horn can be used. Berliner Ultrasonics suggests that the problem with certain solvents is that they tend to wick under the tip-horn interface, thereby leading to cavitation erosion or wear by particulates in the fluid. Wicking supposedly occurs because the inertial forces on the tip during the contraction portion of the horn's stroke cause a small gap to open at the periphery of the tip-horn interface (i.e., the tip "flaps") whereby the fluid and particulates can enter. The problem is reportedly greater for large diameter tips. Because the interface contact area is reduced, a given tightening torque would increase the contact pressure. With contact only at the interface periphery, flapping would be essentially eliminated. Also, Culp has successfully used an O-ring at the horn-tip joint for cavitation erosion tests in molten solder. This approach might also be successful for organic solvents and low surface tension liquids. After significant wear has occurred, replaceable tips can sometimes be renewed by resurfacing the eroded surfaces. The following should be considered. Frequency. When the eroded material is removed, the frequency of the ultrasonic stack will increase. Ultrasonic power supplies (generators) typically have a frequency band within which they will operate properly. This will depend on the design of the power supply. However, this frequency band is typically at least \( \pm \)1% of the nominal operating frequency (e.g., \( \pm \)200 Hz at 20 kHz) or more. The equipment manufacturer can provide the exact specification although the equipment may even operate properly outside the specified band. The tip can be repeatedly resurfaced until the frequency falls outside this band at which point the power supply should no longer start due to its internal protection circuitry. Amplitude. As the frequency increases the output amplitude may change. If the amplitude is critical then it should be measured with a new tip to establish a reference. Then when the renewed tip is installed the amplitude should be adjusted via the power supply to get the reference amplitude. These measurements can be taken in air. Heating. A new tip should be able to run for some time (say 30 seconds) in air without appreciable heating of the tip. If a renewed tip produces appreciable heating then this means that too much material has been removed so the stiffness across the tip's surface is not adequate to support the tightening load. Then the renewed tip should be discarded. 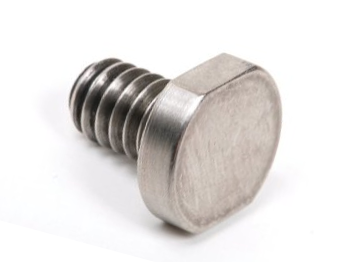 To provide for extra wear, tips can initially be machined somewhat longer than normal. The frequency will then be below nominal (for instance 19.8 kHz instead of 20 kHz). However, the added weight will put additional stress on the tip-horn joint so this method should be avoided if any extra heating occurs at this joint. Flat-faced tips should be renewed before excessive cavitation erosion occurs. Sonics & Materials (p. 16) recommends that the tip should be inspected for cavitation erosion every five to six hours and polished if necessary. Of course, this inspection/polishing interval will depend on the particular circumstances. Apply a thin layer of Dow-Corning #4 high temperature, high pressure silicone grease (or #111 as an alternative) at the surface of the tip that mates to the horn. If a silicone-based grease can't be used then a petroleum-based grease can be used. However, it may leave carbonaceous deposits on the surface and require more frequent joint maintenance. Don't apply any grease to the tip threads. If the tip will come in contact with food products then the lubricant must be approved. In this case, a solid horn may be preferable to a horn with a replaceable tip. For the same tip, table 1 shows that Dukane recommends significantly higher tightening torques than Branson does. The reasons are not known.